Wee Scotty, a fashion shop and school based in San Francisco, is gearing up for its End Of Year Fashion Show. Second to the catwalk, the major pulling point is - of course - the raffle. 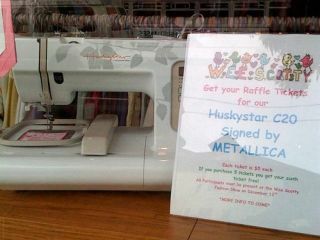 The top prize is a sewing machine… signed by Metallica. The company boasts The Rolling Stones, Madonna and The B52s among its clientele, which, may or may not go some way to explaining how they managed to land such a prize (it's a computerised Huskystar C20, don't you know?). The accompanying image comes from one gentleman's Flickr photo account, taken through the window of the Wee Scotty shop. It's currently doing the rounds on social bookmarking site Digg, hailed as: photographic proof that Metallica's time has passed.